The good news for ukulele players is that the basis of almost all popular music is just three chords. If you can play the I, IV, and V chords of the basic chord families, you have a strong basis to help you tackle almost any song you come across, whether the genre is rock, pop, blues, country, jazz, or punk. The I chord is C.
The IV chord is F.
The V chord is G7. This set of chords is very common, appearing in “When the Saints Go Marching In,” which you can read the standard notation for here and listen to at the link. 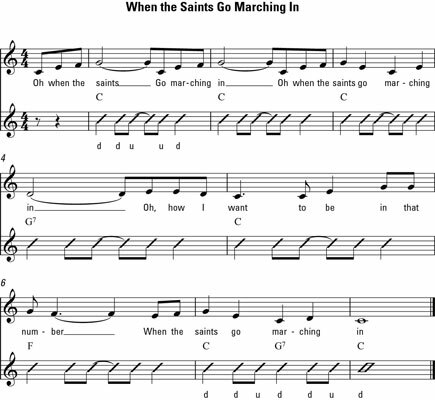 “When the Saints Go Marching In” uses the Swiss army strumming pattern, but watch out for the next-to-last bar, where the chord changes in the middle of the measure.